As reported in the Evening Post, Wellington - courtesy of Papers Past. BRUCE-HOBMAN.-On the 18th March, 1924, at Maranui Methodist Church (Wellington, New Zealand) by Rev. E. f. Olds, John Alexander, younger son of the late Mr. J. and Mrs. Bruce, to Beatrice eldest daughter, of Mr. and Mrs. J. R. Hobman. 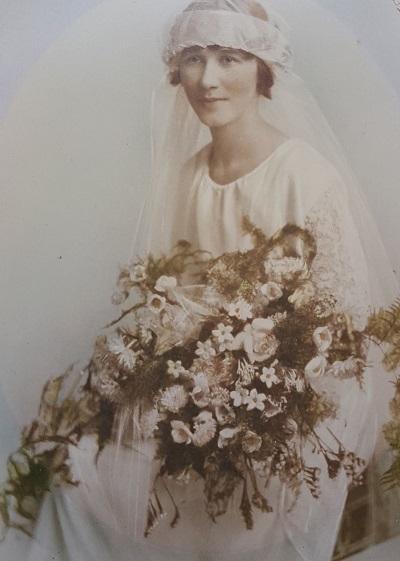 The wedding took place at the Maranui Methodist Church on Tuesday last, of Miss Beatrice Hobman, eldest daughter of Mr and Mrs JR Hobman of Kilbirnie to Mr J Alexander Bruce, well known in cricket and football circles, and youngest son of Mrs B Bruce, Wellington. The Rev ET Olds officiated. The bride, who was given away by her father wore a frock of white crepe de chine, caught at one side with a cascade panel of white radium lace and crepe de chine. A veil of embroided tulle was worn coronet fashion, caught with orange blossom, and a white shower bouqet, with touches of pink was carried. The chief bridesmaid, Miss Eva Hobman, wore a dress of heliotrope satin beaute with radium lace sleeves of the same colour. Her bouquet was of flowers to match. Miss Doris Sawtell, was in a dress of the same colour and material in Early Victorian style, and finished with a posy of flowers and streamers on one side. A pink bouquet was carried. Both bridesmaids wore black hats trimmed with pink and heliotrope. Mr A Gilchrist of Newtown was best man, and Mr J Gregory groomsman. The reception was held at the Picardy Tea Rooms, Lyall Bay. The bride’s travelling costume was of brown and a brown hat trimmed with flamingo feather. The bridegroom’s present to Miss Eva Hobman was a gold ring, and to Miss D Sawtell a gold bangle. Among the many handsome presents received was a silver tea service accompanied by a cheque from the members of the Maranui Methodist Church in recognition of Mrs Bruce’s past services as organist of the church. Beatrice and Alex lived in Kilbirnie all their married life. Alex died in 1970. Beatrice remained in the family home at 3 Tacy Street, Kilbirnie until the mid 1980s. She spent the remaining five years at Wesley Haven Rest Home, Lower Hutt, until she died in 1990. Original generation time 1.5455 seconds. Cache Loaded in: 0.0004 seconds.